I'm resurrecting this long-quiet blog, to announce a special 10 year anniversary event! It has been ten years since I opened my first shop on Etsy, and I wanted to do something special to show all my lovely customers how much I appreciate you. 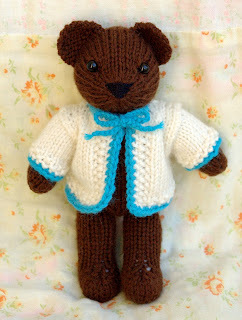 To start off a week of fun give-aways, I've updated my very first pattern: a teddy with a sweet cardigan. You can download it for free, for the whole month of November! I'll announce a new prize each day this week, both here and on my Facebook page, so be sure to check back later! More details will be given each day, but the give-aways will remain open for a while, so don't worry about missing them. I never thought I would still be designing knitted toys ten years after I started, as it was just something to keep me busy between jobs. I've learned so much over the years, tried lots of interesting things, and I am still enjoying creating cute toys for people to knit. I have some projects in mind for the next year or two, so if you enjoy my patterns, be sure to visit and see what I'm up to! Posted by Barbara Prime at 10:20 a.m.
Congrats. I knew you'd be around for a long time to come. Thanks for sharing your patterns with us. All the best to you and yours. November 1, 2016 at 10:43 p.m.
November 2, 2016 at 11:46 a.m.
Congratulations.....thank you for the pattern! November 3, 2016 at 11:20 p.m. Thank you for your beautiful teddy bear pattern. November 4, 2016 at 4:50 a.m. Thanks for the teddy pattern! I love your designs!! November 8, 2016 at 1:47 p.m.